Semagacestat (LY450139) is a γ-secretase blocker for Aβ42, Aβ40 and Aβ38 with IC50 of 10.9 nM, 12.1 nM and 12.0 nM, also inhibits Notch signaling with IC50 of 14.1 nM in H4 human glioma cell. Phase 3. Cultures were assessed in A for TRAP by enzyme histochemistry 5-8 days following exposure to Rankl. Values are means ± S.D. ; n = 6 for all data sets except for Notch2Q2319X DMSO at day 5 where n = 5; the right upper panel shows representative culture fields of TRAP-stained multinucleated cells 8 days after the addition of Rankl. Dibenzazepine (YO-01027) is a dipeptidic γ-secretase inhibitor with IC50 of 2.6 nM and 2.9 nM in cell-free assays for APPL and Notch cleavage, respectively. NSG mice were engrafted with human DND41 cells in 3 independent experiments. After DBZ treatment, marrow leukemia burden was determined by the expression of human CD45 (hCD45). Host LSK (hCD45−) (A), OB (B) and MSC frequencies (C) were determined by FACS in control (receiving culture medium) or in xenografted mice treated with vehicle or DBZ (n=8–9.group). LY411575 is a potent γ-secretase inhibitor with IC50 of 0.078 nM/0.082 nM (membrane/cell-based), also inhibits Notch cleavage with IC50 of 0.39 nM in APP or NΔE expressing HEK293 cells. (E) Quantitation of lumen from A-D. (F) RNA isolated from 6d acini and expression of NOTCH1 measured by qRT-PCR in triplicate. P values are * <.01, *** <0.001. Nirogacestat (PF-03084014, PF-3084014) is a selective gamma-secretase inhibitor with IC50 of 6.2 nM in a cell-free assay. Phase 2. The expression of p-EGFR and NICD was assessed by western blot after treatment for 3 d.
IMR-1 is a novel class of Notch inhibitors targeting the transcriptional activation with IC50 of 6 μmol/L. L-685,458 is a specific and potent inhibitor of A beta PP gamma-secretase activity with Ki of 17 nM. 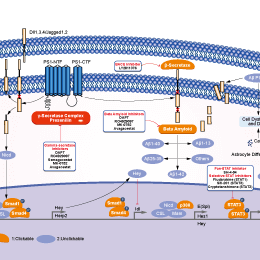 FLI-06 is a novel inhibitor of Notch signaling with EC50 of 2.3 μM. G. In the presence of FLI-06, wound healing assay was conducted to evaluate the cell motility after transfection. Scale bar represents 200 μm. H. In the presence of FLI-06, invasion assay was conducted to evaluate the cell invasiveness after transfection. Data were from three independent experiments and were Mean ± SD. **p < 0.01 compared to cells transfected with vector, ##p < 0.01 compared to cells transfected with ACTG2. Scale bar represents 100 μm. Crenigacestat (LY3039478) is an oral Notch inhibitor with an IC50 of 0.41 nM. Effect of LY3039478 on Hes protein in SGC7901/DDP cells. A, Protein expression of Hes-1 by Western blot. B, Expression level of Hes-1 by Western blot experiment. (*p < 0.05 control with LY3039478 0 μmol/L group; **p < 0.01 control with LY3039478 0 μmol/L group). CHF5074 is a gamma-secretase modulator that reduces Aβ42 and Aβ40 secretion. The IC50s of CHF5074 for inhibition of COX-1 and COX-2 is above 100 μmol/L. NGP 555 is a small-molecule modulator of γ-secretase and has been successful in achieving good oral absorption, brain penetration, CNS activity, and specificity for a lipid-based membrane target preclinically.